By Mateusz Mucha, James Mathison and Tomasz Jedynak - PhD. What is the compound interest? What is CAGR (Compound Annual Growth Rate)? What is the difference between simple growth rate and compound annual growth rate? How to use our CAGR calculator? What is the simple growth rate formula? What is the CAGR formula? How to use this CAGR calculator to determine either CAGR, end value, or the start value of an investment? All this information can be useful when choosing your savings account or figuring out where to place it. You might also need a CAGR calculator when you plan any capital investment. To understand the idea of the compound annual growth rate, first of all, you should know what compound interest is. In finance, compound interest is defined as interest that is earned not only on the initial amount invested but also on any interest. In other words, compound interest is the interest calculated on the initial principal as well as the interest which has accumulated during the consecutive periods. Note here that a deposit or loan grows at a faster rate thanks to compounding. t - the numbers of years the money is invested for. From a formal point of view, if the interest is compounded once per year (so m = 1), then r is called the compound annual growth rate (CAGR). As we have already explained in the introduction, CAGR is an acronym for Compound Annual Growth Rate. The formal definition of CAGR says that CAGR is the yearly rate of return that is required for an investment to grow from its initial balance to its final balance within the particular period. CAGR is counted with an assumption that profits are reinvested at the end of each year of its time horizon. You should be aware that the compound annual growth rate is an approximate figure rather than a true return rate. You can say that CAGR is a number that describes the rate at which investment would have grown if it had grown at the same rate every year during the whole investment period (with an assumption that the profits were reinvested at the end of each year). Obviously, in real life such a situation is almost impossible. However, CAGR is mainly used to smooth the rate of return over the whole investment period and therefore is very useful in comparing different investments. The pros and cons of CAGR are discussed in in detail in CAGR advantages and disadvantages. The simple growth rate formula is used to determine the percentage increase of a value within a particular period of time, which is usually the same as the whole investment period (e.g., three years, ten months, etc.) In other words, a simple growth rate says how much an investment is going to yield within its time horizon. On the other hand, the compound annual growth rate reflects the average rate of return that is required for an investment to grow from its initial balance to its final balance within the particular period on a yearly basis. In the case of CAGR, it doesn't matter what is the time horizon of the investment. Note that unlike the simple growth rate, the compound annual growth rate enables you to compare investments with different time horizons. PV - the initial balance (the present value of the investment). where CAGR is the compound annual growth rate. Note that the CAGR formula is more complex than the simple growth rate formula, as it takes into consideration also the investment time horizon (which may be longer than a year) and the number of compounding periods. Let's go back to our example from the previous section. In May 2015 you deposited $1000 on the bank account with an interest rate equal to 9.14%. After the first year you had $1000 * (1 + 0.0914) = $1091.40. You kept this amount on the bank account for the next year. (If you are not sure about this calculation take a look at our simple interest calculator). After the second year you had $1091.4 * (1+ 0.0914) = $1191.15. Once again, you left this amount on your account. So after the third year you had $1191.15 * (1 + 0.0914) = $1300. It is the same amount as the final value of your investment from our example. Note here that, if you have a savings account or a deposit, the CAGR formula is more recommended then simple interest formula. If you need to find out more about compound interest and ways to calculate it, check out our compound interest calculator. Another tool that you can use to estimate the profitability of investment is our return on investment calculator. Divide the final value of the considered investment by its initial value. Raise the result to the power of one divided by the number of years in the investment period. Subtract one from the result taken from the previous. Let's try it in practice. To do so, let's look at the following example. The market value of a company, Big Bite, between 2012-2018 is given in in the table below. What is the CAGR of this company during this period? The compound annual growth rate in this example was 5.4682%. So the average yearly increase of "Big Bite" during the period 2012 – 2018 was 5.4682%. It can be seen in the table below. If you are still not sure how to calculate the growth rate, don't worry. It is easier than it sounds. 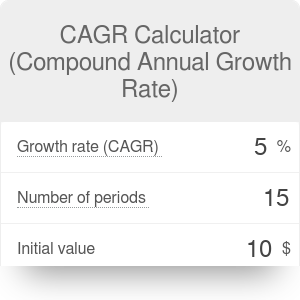 Instead of performing many complicated mathematical operations in order to calculate the compound annual growth rate, you might like to try our CAGR calculator. To determine the final value of your investment with the given CAGR, all you need to do is to fill first three boxes with appropriate values (Growth rate (CAGR), Number of periods, Initial value). The calculator will automatically determine the final value of your investment. If you want to use the tool inversely and find the growth rate, you have to fill in all the boxes except the first one (Number of periods, Initial value, final value). You can also use the advanced mode of the application. This function allows you to check the difference between the initial and final value and estimates the total growth as a percentage. Although the CAGR formula is relatively simple, it has a variety of uses. You can use the compound annual growth rate formula either to estimate the average growth of a single investment or to compare investments of different types. As a measure of investment profitability CAGR has a number of advantages and disadvantages. CAGR is one of the most accurate ways to calculate the return on an investment that rises and falls in value during the investment period. CAGR allows investors to compare investments with different time horizons. CAGR makes it possible to compare profits from a particular investment with risk-free instruments. It also allows you to assess whether the premium for the risk taken is high enough. CAGR does not take into account the investment risk. As CAGR reflects a smoothed growth over the investment period, it doesn't reflect the volatility of the investment value. In fact, CAGR suggest that the growth rate is constant. With CAGR it is impossible to calculate the profitability of an investment with inflows and outflows during the investment period. It is because the CAGR computes the rate of return only on the basis of the initial and final balance of the portfolio. Well, this is a great achievement, right? Now, the CAGR value is not as impressive as it was previously. Now that you know how to calculate CAGR, it's high time you found other applications which will help you make the greatest profit from your investments. To compare bank offers which have different compounding periods, we need to calculate the Annual Percentage Yield, also called Effective Annual Rate (EAR). This value tells us how much profit you will earn within a year. The most comfortable way to figure it out is using the APY calculator, which estimates the EAR from the interest rate and compounding frequency. If you want to find out how long it would take for something to increase by n%, you can use our Rule of 72 calculator. This tool enables you to check how much time you need to double your investment even quicker than the compound interest rate calculator. You may also be interested in the credit card payoff calculator which allows you to estimate how long it will take until you are completely debt-free. Another interesting calculator is our cap rate calculator which determines the rate of return on your real estate property purchase. Mateusz Mucha, James Mathison and Tomasz Jedynak - PhD. CAGR Calculator (Compound Annual Growth Rate) can be embedded on your website to enrich the content you wrote and make it easier for your visitors to understand your message.